I normally don’t care for fruity rhubarb type fragrances, mostly because rhubarb has a weird “twangy” kind of smell that I don’t care for. So, I was a little hesitant about burning this scent from Pure Integrity. I’m glad I took a chance and decided to review it anyway because it ended up happily surprising me. When I popped off the lid to smell the wax for the first time, I didn’t detect that twang I dislike… I simply smelled a sweet strawberry aroma and it was sugary and very refreshing. Okay, maybe I could detect a teeny bit of rhubarb but it was subtle and in the background which is where it should be. It didn’t overpower the sweet strawberry. I was happy!! The aroma of sweet fresh strawberries mixed with tart rhubarb and just a pinch of sugar. It will take you back to simpler times, when your Grandmother was making homemade jam. Great description and that’s exactly what this fragrance smelled like. 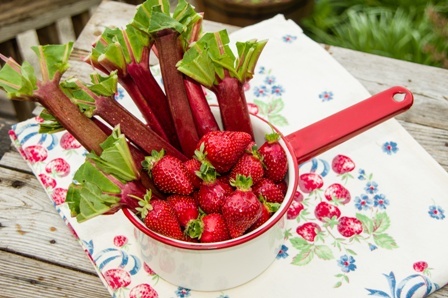 Ripe strawberries, a touch of rhubarb and sweet sugar. I was pretty impressed. Time to light my candle. Pure Integrity candles are generally strong for me so I decided to burn this candle in my master bedroom. Once the wicks were lit, it didn’t take long to reach a full melt pool (10 minutes max) and soon after that… the sweet aroma of strawberries and sugar filled my bedroom. It was saturation strong and bonus, the aroma was even spilling outside my bedroom into other parts of my home. The scent itself… I can’t believe I’m saying this but the rhubarb component was actually pleasant and blended well with the strawberry. It wasn’t overpowering at all. My entire room smelled like sweet and sugary strawberries with a hint of rhubarb in the background. It was perfect and I really enjoyed it. I also want to point out, this was one of the freshest strawberry scents I’ve ever tried. Very realistic and matched their description to a T.
Strength – on a scale of 1 to 10, I would rate this candle a 13 in any size room. It was very strong and I loved every second of it! My candle burned perfect. Zero issues. Clean burning from beginning to end. Well, I can safely say I finally found a rhubarb scent that I like, well, loved actually! My husband even commented on the fragrance letting me know he liked it. I asked him what he smelled and he simply said fresh strawberries and that’s pretty much what I smelled too. I highly recommend this fragrance to all you fruity scented lovers out there… especially if you love sweet strawberry scents. I loved it and will definitely be back for more. Thanks Christina! 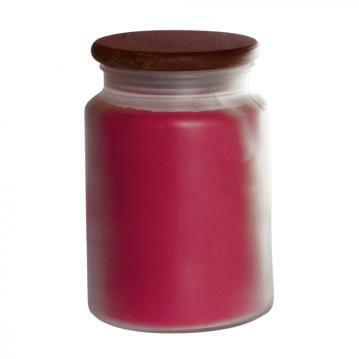 I love Pure Integrity Candles, they are one of the best brand of candles out there. They burn nicely and are nice and strong without being overpowering! I will definitely give this scent a try, it is one I probably wouldn’t have tried otherwise, but your review makes me want to give it a try! Thanks Christina……I love Pure Integrity Candles after you turned me onto them. I havent tried the Strawberry Rhubarb but after your nice review of this scent, it’s defiantly on my try list. For anyone who has not tried Pure Integrity candles yet their one of the best candle makers out there. Awesome! Hope you like it Brad. When you do, let us know what your thoughts were. I always love hearing back from fellow candle lovers.